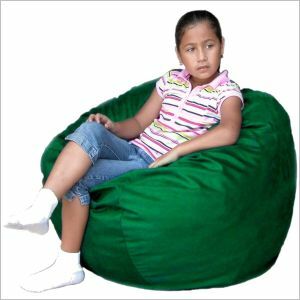 A toddler bean bag chair may well become your child’s favorite place to snuggle up on when he just wants comfort and quiet. 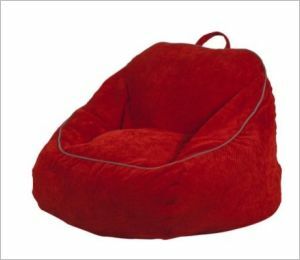 There’s something that spells ultra-comfort about a bean bag chair: maybe it’s the way the beans slide around inside the pillow, giving an ultimate form fitting experience; maybe it’s the little knobby edges these beans have; little knobby edges that deliver a gentle massage as one fidgets or moves about. Different people have vastly different ideas what a toddler bean bag chair means. For some, it looks like a little easy chair only made entirely of cloth and beans or beads. For most, it would be a big, comfy sphere or oval that the toddler can crash into when he’s feeling wild, kick about when he’s feeling exuberant, and melt down on when he’s feeling tired. Not too big, though;he is, after all, only a toddler. What do you need to look at when you shop for a toddler bean bag chair? Enough room to relax on: sure, he’s not six feet long, but a footstool sized bean bag that your toddler can only perch on the side of won’t cut it. Soft material; this is meant to be relaxation station #1. Durable; it’s not a piece of furniture you want to have to guard with ‘be careful with that!’ every half hour; his bean bag is one thing your toddler should be allowed to treat roughly. Then, of course, a washable cover means extra bonus points: if your little ones are anything like mine, they have a wonderful talent to get things dirty. What do other parents say are the best toddler bean bag chairs? Two top favorites are Circo Oversized Bean Bags and Cozy Sack 2 –feet Kids Foam Bean Bag Chair. Both of these chairs come in a variety of colors, and both can be ordered directly from Amazon and delivered to your door. A Circo Oversized Bean Bag is very like a toddler armchair, but it’s filled with polysterene beads that feel essentially like beans. The chair is small enough to be a comfy fit for a toddler, but big enough that he won’t outgrow it till he’snine or ten years old. It is fairly sturdy, and sports a little handle that allows your toddler to drag it all around the house. A major downside is that this chair is spot clean only, but the fabric is soft and comfy, and is available in enough colors that you can choose one that won’t show dirt quickly. Some options are pink, navy, orange, or turquoise. The Circo Oversized Bean Bag Chair is nice. But if you really want the ultimate bean bag chair for your toddler, you may prefer to buy him or her a 2-foot Cozy Sack Bean Bag Chair.To be absolutely honest, there aren’t any beans inside this one either: it’s pieces of foam. That is the one downside to this chair, although the manufacturers will tell you it is a benefit: the high quality virgin urethane foam pellets are soft and springy, making the chair super-duper comfy. Other benefits? Large enough for your toddler to grow with, but not so large he’ll feel overwhelmed. Well made and sturdy: there’s no shoddy Chinese workmanship here; this is a product made in the U.S.A. Best of all, for many toddler mothers, the soft microfiber cover can easily be removed and laundered. This chair also comes in a huge variety of fun colors: everything from subdued hues like black, buckskin, and chocolate to deep cinnabar, hot pink, or hunter green; gray, earth, and medium brown, lime, navy, olive, or pumpkin, purple, royal blue, rust or sage. With a list like that, you shouldn’t have any trouble matching your home décor. Whichever toddler bean bag chair you buy, make sure it’s one your toddler can have fun with!